Line the bottom of the tin with non-stick paper. Whisk the two eggs and egg yolks together. Grate the rind from the orange and then juice the orange. In a food processor mix the flour, caster sugar, spread, grated orange rind and egg mixture together until well blended. 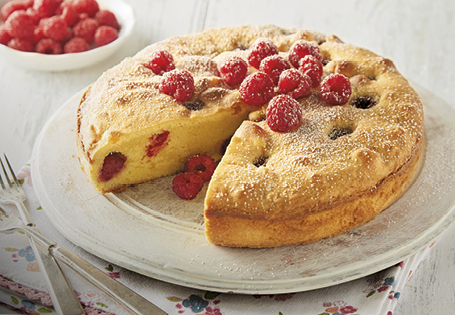 Spread half the mixture in the bottom of the tin – sprinkle over the raspberries – then spread over the rest of the cake mix. Bake in the oven for 45-50 minutes – until the cake is golden and risen – test with a wooden skewer – if the skewer comes out clean, it’s done – if not return to the oven for a further 5-7 minutes. Sift the icing sugar into a bowl, stir in the orange juice until you have a smooth icing – drizzle over the cake and serve.